Seton Hill University students, faculty and staff gather for Seton Hill’s opening liturgy on Sept. 13. Photo by A.Daumit/Setonian. Students and faculty of Seton Hill University (SHU) came together on Sept. 13 for the annual opening liturgy and “Be the Story” program. Required for first-year students, for the second year in a row, the event welcomed all faces new and old. In addition, members of Narrative 4 spoke to the students about their experiences. At the start of the event, students were seated in Cecilian Hall where they were shown a video titled “What is a Setonian?” created by Director of Student Involvement, Elise Michaux. The group then watched a TED Talk by Nigerian writer Chimamanda Ngozi Adichie called “The Danger of a Single Story.” The video talked about how hearing one story about a person or where they came from can lead to an exorbitant amount of misconceptions and stereotypes. 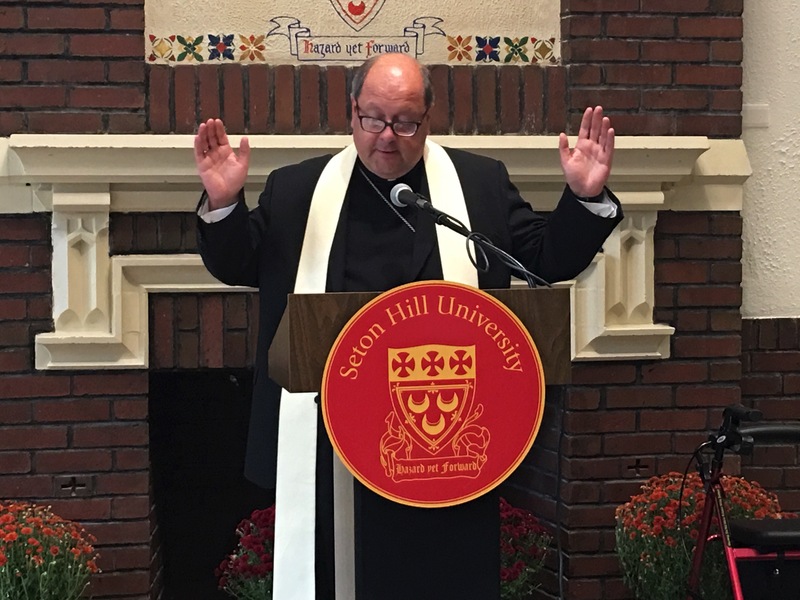 Greensburg Bishop Edward C. Malesic speaks as he blesses Seton Hill’s newly renovated dining hall on Sept. 13. Photo by A.Daumit/Setonian. Freshmen and faculty members were then split into small groups to discuss what they’d watched. “It was really interesting to think about the different backgrounds people have at SHU,” said freshman Sammy Kaufman. Following this discussion, students were ushered into St. Joseph Chapel for the opening liturgy, led by Greensburg Bishop Edward C. Malesic. Though the liturgy was a Catholic mass, the entire SHU community was encouraged to attend. 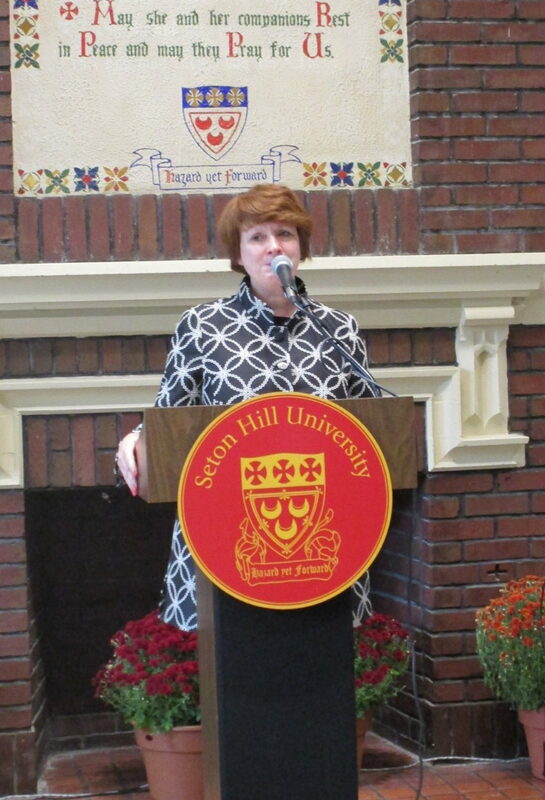 Seton Hill University President Mary Finger speaks at the rededication and blessing of Lowe Dining Hall. Photo by A.Daumit/Setonian. Through music and prayer, students were able to strengthen their connection with each other and the university. With all the activity and stress brought on by a new semester, those who attended could step away and enjoy a moment of peace. “You are all a blessing to me,” said Malesic. Under the direction of Mark A. Boyle, director of choral activities, members of SHU’s chamber choir, Una Voce, performed, as well as the SHU flute ensemble. Senior Brett Cuddy served as the cantor for the liturgy alongside music instructors Boyle, Curt Scheib and Crystal Stryker. There were two additional music professors that contributed as well: Theodore DiSanti played the trumpet, while Kathy Campbell played the soprano saxophone. At the conclusion of the liturgy, everyone was encouraged to make their way to Lowe Dining Hall where the rededication and blessing of the newly renovated space would take place. SHU President Mary Finger was there to welcome all in attendance, followed by the Sisters of Charity. This day was a way to welcome back all those returning to the Hill this year, and a warm welcome for all first-year students. This was also an opportunity for the SHU community to get reconnected as a new semester begins. “Church builds community as university builds community,“ said Malesic.